Nosema apis is a long-established pathogen of the western honeybee, Apis mellifera, and often causes dysentery reducing the lifespan of bees. A new variant, Nosema ceranae, discovered as a parasite of Apis cerana in the 1990s was first identified on the western honeybee, A mellifera, in Spain in 2004 and has been associated with Colony Collapse Disorder (CCD) in the USA and bee deaths in Europe. Evidence in the USA suggests that Nosema apis is not a primary cause of heavy colony losses. In Spain, the evidence is more complex and research suggests that in some cases it may have been the primary cause of widespread colony deaths. Whatever the explanation, it is clear that removing the stress of Nosema can help colonies survive. Nosema apis and Nosema ceranae are parasitic Microsporan organisms that can cause Nosema disease and dysentery in honeybees. The group Microspora is unicellular and spore-forming in nature. They are not visible with the naked eye; microscopic examination is necessary. 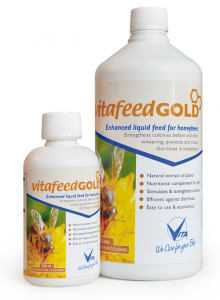 VitaFeed Gold is a specially formulated feed that boosts colony growth and brood populations. As such, VitaFeed Gold can be useful in building up colonies that have been weakened by disease. Nosema is very difficult to identify. Nosema-infected bees do not look much different from non-infected individuals, but certain traits are evident even before microscopic analysis and confirmation of disease. The lifespan of infected bees is often reduced and infected colonies often dwindle in late winter or early spring. In cases of Nosema ceranae, colony death can be even faster than with Nosema apis and may take only a few days – foraging is particularly affected and bees are often too weak to return from foraging flights. Dysentery is a prime symptom of bees infected with Nosema apis, but it is not a symptom of Nosema ceranae infection. Nosema apis infection causes young adult bees to change their behaviour. They stop brood-rearing and attending to the queen earlier than normal and instead they start foraging and guarding the hive like older bees. This reduces the number of new foragers and honey yields are reduced. The life span and egg production of infected queens also reduces and this encourages queen supersedure. Nosema apis infection tends to cause adult bees to become bloated with water and this leads to dysentery. Digestion and production of royal jelly can be severely affected. If infected bees are confined to hives during cold weather, hive parts, combs and frames will become contaminated from faecal material. This is more obvious in spring when yellow-brown faecal spots can be seen on the outside of the hive after the first cleansing flights. Nosema infection can be transferred to bees as they clean their hive and since cleaning behaviour and polishing increases rapidly during spring, the level of Nosema apis infection rises sharply at this time. All adult bees can be infected by Nosema with serious consequences for the colony. Nosema apis spores are ingested and then germinate very quickly (Bailey, 1955) invading the mid-gut and epithelial cells of the bee. Huge numbers of spores, often more than 30 million, can be found in the mid-gut during a Nosema infection (Bailey and Ball, 1991). Good beekeeping will help to prevent Nosema. 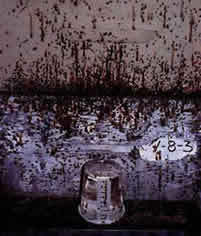 Stress factors such as damp apiary sites, lack of nutrients. lack of space or infection with any other disease can contribute to Nosema outbreaks. Fumagillin fed to colonies can suppress the effects of Nosema apis and – where permitted by local regulations – can be administered as a prophylactic or as a control treatment. No other registered treatments are known.